Finances are in place for a £300m snow sports and entertainment complex, according to a council report. Plans for SnOasis at Great Blakenham, near Ipswich, have been in the pipeline for 18 years, with outline planning consent agreed more than a decade ago. The report, drawn up by officers at Mid Suffolk District Council, will go before the planning committee on 13 March. The 123-hectare (304-acre) complex could open by the end of 2023, it says. Under the plans, the site would house a indoor snow facility, featuring ski slopes, a bobsleigh run and an ice wall. The complex would also feature a bowling alley, nightclub, casino, cinema, climbing and food court. 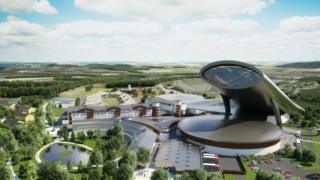 A hotel and shops are also planned for the former quarry, plus a speed skating circuit and sports academy. It is hoped winter sports athletes will base themselves at the site for training. The planning committee will be asked to grant the acting chief planning officer the right to approve the final details, known as reserved matters. This represents "a crucial step forward in the life of this long-standing project", according to the report. It adds: "Officers understand that financial backing is in place and that it is intended, if reserved matters approvals are granted in accordance with the recommendations herein, to have the entire facility capable of operation by the end of 2023." The eight phases of the reserved matters include final details of the complex, parking, ecology and structural landscape. Developer Godfrey Spanner previously said the "unique winter sports resort and facility" would deliver "significant local, regional and national benefits". Outline planning consent was granted in 2008 but the project was delayed due to the "recession and ecological matters". Previous plans for a railway station have been scrapped.